Shah Rukh is the supreme ruler of the Timurid Empire and the son of the great conqueror Timur. Much has changed since the death of the Great Emir however, and his empire that once stretched from Anatolia to Delhi. Shah Rukh has been able to keep most of Timur's empire together and patronized a thriving center of learning and arts in Herat, the pearl of Khorasan, but his reign is near its end and the aging ruler has fallen ill during the past year. In the outer provinces sons and grandsons are observing the court in Herat with great interest. Ajam under Muhammad bin Baysonqor is already independent in all but name. In Astarabad, Khorasan, his brother Babur has built a small power base for himself, no doubt with the only goal to have a base in the coming succession struggles. Transoxiana, and Timur's own old capital Samarkand, has been left in the able hands of Ulugh Beg, son of our ruler and a great patron of the sciences and arts, while Fars is in the hands of a 12 year old prince of the dynasty. Meanwhile the Qara Qoyunlu Federation has taken over many of the western parts of Timur's original empire and in southern Iraq the millenarian Mushasha have conquered Khuzestan and ousted the Timurid administrators from that region. The Uzbeks are continually raiding our holdings in Transoxiana and our Indian governors have been ousted from Delhi. In 1444, Timur Lenk (aka Tamerlane) is long dead, but the remnants of his empire still control the Persian heartland. The Timurids are a Sunni Iqta Empire. With Cradle of Civilization, they follow the Hanafi school. Their position gives them easy access to the formation of Mughals which they can do by conquering some of Delhi and Jaunpur's starting territories. The Timurids' starting position is precarious due to the high variation of the frequent revolts. Uniting the empire will be difficult, but will allow the Timurids to become a major player in world politics due to its powerful starting position and its access to Muslim land units. In the beginning of the game, the Timurids have many vassals : Transoxiana, Sistan, Afghanistan, Fars and Khorasan. When Shah Rukh dies, all the vassals will have an additional 55% liberty desire due to lost modifiers, so it's difficult to maintain control over them. Persia in particular should it appear. −50% liberty desire in subjects. When he dies, the powerful Timurid vassals, representing the various Timurid princes and governors, are very likely to rebel, partitioning Timur's empire. This infobox may contain outdated information that is inaccurate for the current version of the game. The last version it was verified as up to date for was 1.24. The aging ruler of the Timurid Empire, Shah Rukh, has been ill since the beginning of 1444. 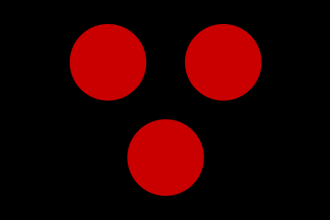 In his absence his wife, Goharshad, had taken over the daily rule of the empire but this sign of weakness has set wheels in motion among the princes that rule the Timurid provinces. In western Iran the young prince Muhammad Baysonqor, an ambitious grandson, has started to accept taxes and tokens of loyalty from a much larger region than his assigned governorate. Having finally recovered and learned of this insolence Shah Rukh has now declared Muhammad Baysonqor a rebell and is moving to strike at him at first opportunity. If a civil war among all sons and grandsons, like that at the end of Timurs life, is to be avoided Shah Rukh knows he must strike down any sign of rebellion harshly and quickly. Only time will tell what the other princes will do. As long as Shah Rukh lives, as the ruler of the Timurids he will greatly reduce the liberty desire of the remaining vassal countries ruled by his sons and grandsons. After a lifetime of war and iron fisted rule, Timur's heir and son, Shah Rukh, has finally passed on. His life's work has been to keep the empire his father built together, unifying it after Timur's death and then stamping out any rebellions against his own rule. Shah Rukh brought peace to many parts of the empire and under his rule the arts and sciences have blossomed. During his last years he has been ill often, however, and his sons and cousins have used this time to prepare for the inevitable war of succession. We will no longer have the benefit of the reputation of Shah Rukh and the Timurid vassal princes will therefore most likely start to plot for the throne themselves. Shah Rukh brought peace to many parts of the empire and under his rule the arts and sciences have blossomed. During his last years he has been ill often and his sons and cousins have used this time to prepare for the inevitable war of succession. The Timurids will no longer have the benefit of the reputation of Shah Rukh and all vassal princes will therefore most likely start to plot for the throne themselves. We can now use the decision Enthrone Timurid Prince to invite a Timurid claimant to rule our country if we fulfill its requirements. Our illustrious monarch, Ulugh Beg, has indicated that he desires to build a grand observatory so that Samarkand will become the center of astronomical learning for the entire world. His beliefs are summarized by the words he wishes to have carved on its walls: 'Religions rise and fall, empires crumble into dust, but the works of science are for all time'. But however noble his intentions, such projects are very costly. Should we build the observatory? We have neither the time nor the money for such foolishness! Amir Timur once crushed all realms in this region and entrusted their rule to his relatives. Ever since they have been torn apart by the Timurid princes' lust to rule it all, and there are many princes who could yet stake their claim to Timur's empire. Some local rulers have been known to invite Timurid claimants to their states, propping them up as leaders, and using the strength Timur's name to extend their rulership over all lands he once ruled. does not have a ruler of the Timurid dynasty. monarchy but not a feudal theocracy or a tribal federation. primary culture in the Iranian group, or it is Uzbek or Turkmeni. owns and cores one of the following provinces: Teheran, Isfahan, Herat, Kabul, Ferghana, Samarkand, Qom, Astarabad, and Shiraz. gets a ruler and a heir of the ‘Timurid’ dynasty (former heir is removed if applicable). This will make it possible for us to form the Timurid Empire. As the descendant of Timur Lenk, the great conqueror of Iran, Transoxiana and Khorasan, it is our duty to reclaim his legacy. With the traditional Timurid Strongholds under our control we can at last proclaim ourselves the head of Timur's dynasty, and the leader of all of the Ghurkani princes. Playing with normal or historical nations. This decision was not enacted before. has a ruler of the Timurid dynasty. owns and cores the provinces Samarkand and Herat. moves its capital to Samarkand. leaves the Holy Roman Empire, unless it is an elector or the Emperor. changes its primary culture to Uzbek. 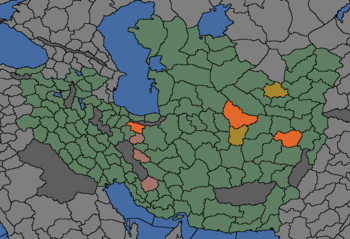 gains a permanent claim on all unowned, non-core provinces in the Persia and Khorasan regions. gains a permanent claim on all unowned, non-core provinces in the following areas: Transoxiana, Arys, Transcaspia, Khiva, Ferghana, Khuttalan, Basra, Iraq Arabi, Al Jazira, Armenia, Kurdistan, and Erzurum. gets country event “New Traditions & Ambitions”, unless it has custom ideas. Provinces in orange must be owned and cored to reform the Timurids. All of either the red or blue provinces must be owned and cored. Shaded provinces are permanently claimed after formation. Yuan dynasty, provided they switch to a Pagan or Eastern religion. The heirs of Kublai Khan once ruled over all Chinese and Mongol lands. Let us rise to reclaim the legacy of the old Yuan and crush the weaker lineages that have attempted to claim the Empire that is our birthright! is in the Altaic culture group. it must own at least 8 cities. owns its core provinces Kaifeng (688), Xilin Gol (723), Beijing (1816), Qaraqorum (2190), Xuanhua (2136), and Xiangyang (2171). owns or has a non-tributary subject own all provinces of Mongol, Chahar, Khalkha, Oirat, or Uyghur culture. then the country must be the Emperor of China. Beijing (1816) leaves the HRE. −50 opinion with a yearly decay of 1.
has its capital renamed to Khanbaliq. gets a permanent claim on every province of China, Manchuria, Mongolia, and Tibet that it does not own. has its capital renamed to Xanadu. has its capital renamed to Zhongdu. The Timurids are in a tough position at the start of the game. After the death of the initial ruler, all their vassals will turn rebellious. Any player wishing to succeed as the Timurids should tackle this internal problem first, or else will likely face disaster. As a first step, Timurids should declare a war on Ajam which holds Timurid's cores and annex as much as possible of them. Mercenaries and loans would be probably required. That will decrease liberty desire of the vassals. Meanwhile the war is going on, diplomats should work on improving relation with a potential ally, the vassals or fabricating claim on the next target - vassals in war can't declare independence. However if they still have high liberty desire, they will not participate actively in the war apart from defending of their own land. Uzbeks have few Transoxiana's cores which can be conquered before annexing this vassal. Another possible strategy for dealing with the vassals is to simply release them one at a time, until the remaining vassals are loyal. The player can then integrate the remaining vassals, and then reconquer the vassals that were released earlier on. This should not be too difficult, and is probably the most reliable starting strategy. If the player pursues this path, try not to release Transoxiana as they will be hard to beat later on, or Sistan as the player does not start with any cores on them. When the vassals are under control and annexed, the player has a lot of choices. If the player is successful at this, the Timurids will be a strong regional power with potential to become one of the strongest countries. By conquering Delhi the Timurids can form the Mughals, who get strong national ideas, and missions to conquer much of India alongside extra bonuses for conquering culture groups. The player could also choose to go north and conquer the steppes of Asia, or go west to try to measure up to the Ottomans. Good option is also not to rush to form Mughals but finish the Timurids missions providing permanent claims (if any remaining). Then after forming Mughals and completion of Pacify Punjab mission, Mughals get missions providing claims on Persia and central Asia steppes (Afghan Frontier and Abu Said's Dream). Best if the player push into the west to conquer Persia, Basra and Gulf of Aden trade nodes before Ottomans will do it. Not necessarily each province but rather as quickly as possible to conquer the provinces bordering with Allepo and Crimea trade node. And start to consume Arabia. Rest of the landlocked provinces can be conquered later as Ottomans won't be able to do it. The player should find a strong ally and sacrifice 1 dip point for exceeding the relations limit in the beginning of game. This will make Timurid's vassals less likely to declare independence war. Fortunately, the Timurids rarely have any problems securing allies as many nations around them start out with friendly attitude. Ideal choice are Ottomans which usually become a juggernaut quickly. They will be especially helpful in wars against Qara Qoyunlu and Mamluks. If the Ottomans are managed to remain a long time ally and their expansion into east is blocked, they will push into North Africa and mainly Europe. They can be used as an excellent battering ram against Russia and for increasing of warscore during wars with European colonizers or any nations buying provinces in Africa/Asia. In case Ottomans are losing their war, it is better to support them to turn warscore in their favor. Losing a war may result in a broken alliance and that can easily turn into rivalry. Fine ally might be also one of the hordes bordering Muscovy/Russia (e.g. Kazan or Great Horde), ideally a common ally with Ottomans. They will anyway need a help to criple Russia during initial wars till they become strong enough to compete Russia alone. While expanding into southeast Asia, Tibet or Mongolia, the war against protector Ming is inevitable. If Russia is not blocked from expanding into Siberia, it is just a matter of time when both superpowers start to clash, so that is the time to declare war on one of them or on Ming's tributaries. While holding whole Persia trade node, only a little money will flow away from it (after Mughals forming, the player needs to move home trade port back to Persia). Timurids/Mughals will definitely need Trade idea group to be able to direct the trade from Basra, Gulf of Aden, Samarkand and India into Persia. An option is to push this strategy even further and conquer from Mamluks complete Red Sea coastline in Alexandria trade node. Ottomans will then not be able to colonize/buy provinces in India/Spice Islands due to huge range and disrupt player's invasion there. Samarkand is vulnerable even if holding most of centers of trade, thus conquering as much land as possible there is required in order to keep the trade flow into Persia secured. Conquest of inland Ethiopia should not be a priority. Mughals can instead keep there a vassal/march and feed it by the Ethiopian lands - e.g. sunni Funj or some of the Somalian sunni states. Conquest of Cape of Good Hope might be a a more difficult task as it will require a war against one or more European colonizers. Conquest of Alexandria and keeping the trade power is too difficult as half of Europe usually steer trade from here. Thus much easier is to hold Gulf of Aden and Basra to steer trade to Persia and collect trade in Cape of Good Hope with using enough trade ships. Most of the wealth routed from India and Spice Islands can be then securely steered and collected and not much will reach Europe. The later game depends a lot on what paths the player decides to follow, but often a strong rival appears to challenge the supremacy of the player, and it is important to not be unprepared when this happens. Likely rivals are Russia expanding in the north, or Ottomans to the west. The Player should have strong allies by this time, and/or a powerful military themselves. ↑ Since a custom nation won't have any of these tags, this just means it isn't an AI-controlled custom nation. Bug report.